It's one thing Britain is good at! Football, Rugby, Cricket, Tennis, we invented them all and spent years practicing how to play badly at them! Now if only raining was an Olympic event we might have more chance! We may not be able to simulate rain on a model but the after effects in the form of streams, rivers, lakes etc we certainly can. So here are a few ideas to get you started. 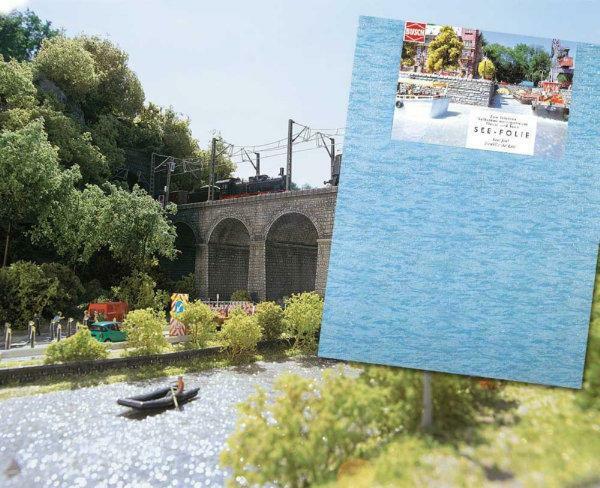 First you can decide to model either still water in the form of canals and lakes, or moving water in the form of rivers and tidal areas. So lets consider still water first. Water on a roll is a an easy to apply plastic sheet which simply sticks down onto a waiting flat surface. Once glued down you need to add some scatter and lichen around the edges to mask the join from land to water, but once done you have a quick and easy lake or docks. Well that's fine as well. Instead of a sheet of plastic you can make moving water scenes using a liquid which moulds around contours etc before setting. First ensure your waterbed is sealed so none of the liquid can escape (the liquid has a thickness of treacle so it's not hard to use). We recommend a plaster base to provide the water tight surface. Add to the base a few reeds and stones, then once dry paint the river bottom with blues, greys and greens to add realism. Complete kit for creating streams and brooks. The detailed and easy to use step-by-step instructions contain many tips and techniques for designing naturally flowing water. 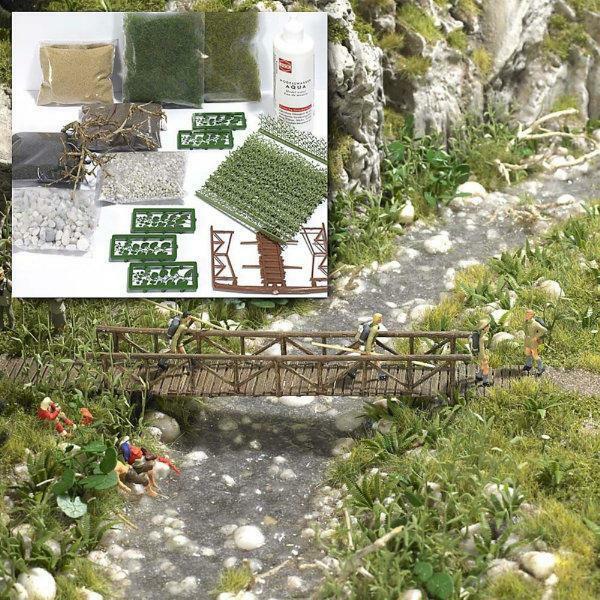 Contents 125ml Aqua water material, several colours of quartz sand for the stream bed, stone, wild grass fibres, reeds, fern and leaves for modelling the banks of the stream, a wooden bridge, small animals, fishes and driftwood.